Recently, our nine-year old (turning 17) declared that she is done with rainbows and forest friends in her room. “I’m into Boho now”, she’s stated. I’m pretty sure I didn’t know the term “Boho” when I was nine, but in her eyes it means arrows and feathers, matching a pair of her favorite pajamas. And so, with that, and the fact that we are in a new house, we are ditching the rainbow motif and siding on a Bohemian retreat for her new room. The furniture will remain the same, so for this project I am simply painting and switching out all the decorative elements. To create the bohemian vibe, I will be adding layers of pattern and texture. Although I would like to think that this room will grow with her into her teens, I know it’s wishful thinking on my part. Therefore, to increase the longevity of this room I’m going to incorporate some classic items (such as the navy duvet covet), that can easily be updated in any future room design. For the bolder design choices (like the area rug), I’m going to stick with budget friendly options as I know they may lose my daughters adoration over time. This has been a fun project to work on together. The design board created below provides a visual guide for some of the key elements that will be implemented in the space. Fingers crossed she loves the finished product. Currently my kitchen is gray, on gray, on white, on gray. I love the simplicity of it, but in between the rain and the rain, I’m looking for some sunshine! I’m looking to add some color to my kitchen without changing the color of my kitchen. Changing up the accessories in a room can instantly alter the mood of a space without a major overhaul. 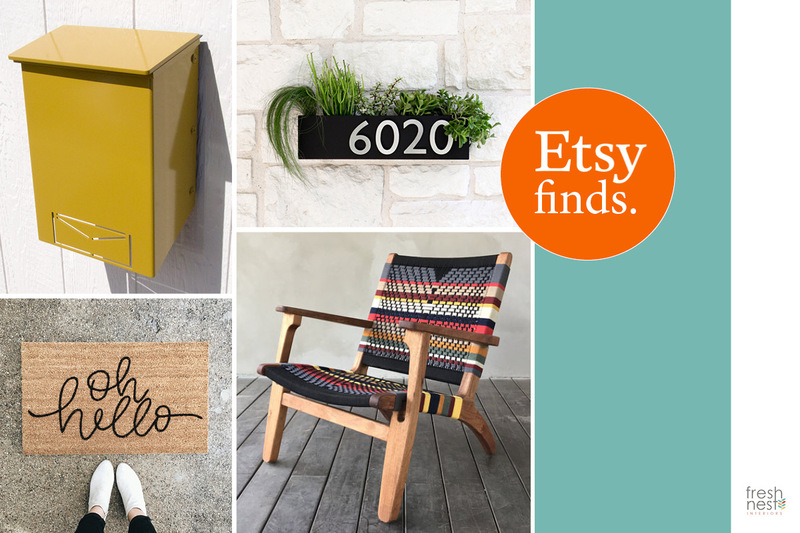 As always, I start my search with ETSY looking for some fresh, original products to add interchangeable color to my kitchen. I’ve noticed a trend in my search… and may have to write a future blog posting on ‘paint dipping’. I absolutely love it. Here are my top picks for adding instant color and SUNSHINE to your kitchen. Sometimes inspiration for a room can come from the most obscure item. It can be anything; fabric, artwork, pillows, jewellery, nature, socks…anything! No matter what the item, the one common denominator is that the item holds personal meaning for someone. It may be for its color, shape, texture or memories, but it is CHERISHED. The farmhouse has been one of my favorite projects to date. My clients were a lovely couple with a beautiful old farmhouse on a picturesque dairy farm (complete with indoor ice rink). They were recent ‘empty nester’, who were looking to update their ‘country’ home for a fresh, inviting, “country-ish” home. 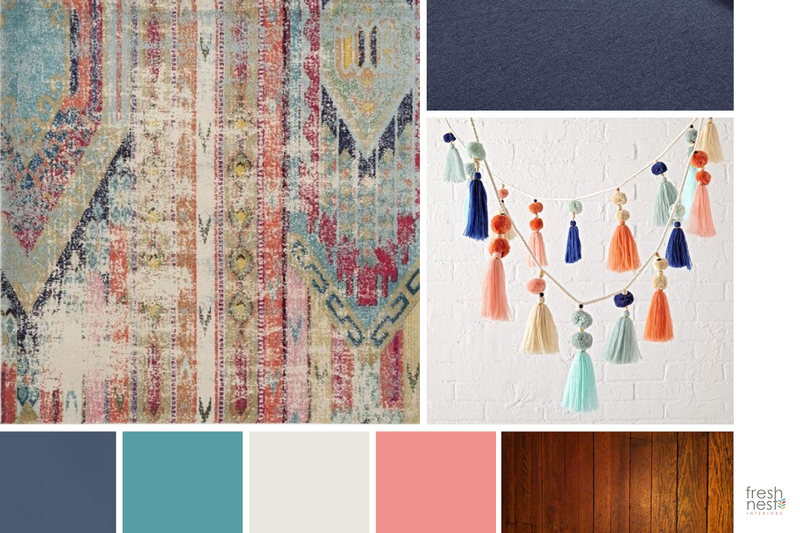 This particular ‘color story’, is for their front entry and living room. Inspiration was gathered from the beautiful gardens and fields surrounding the house.